The 82nd season of the American Dance Festival opened last night in the Durham Performing Arts Center with the most powerful performance yet from Shen Wei Dance Arts. We in Durham have a unique relationship with SWDA: It was here in Durham, at the ADF, that the genius of Shen Wei was launched into the wider world. Even as an improbably slender and supple student, Shen Wei caught the eye, and beginning with his earliest works, I have been a devotée. With the support and encouragement of the ADF, he formed his company in 2000, and has returned regularly to his “summer home.” Although he is now an well-established international star, and the recipient of a long roster of awards and high honors, he is, in a way, ours, like family. Our brilliant little cousin is all grown up. The new work is a staggeringly beautiful synthesis of Shen Wei’s ideas about visual and kinetic mark-making; the revised older work has greater authority and expansiveness. Whether, as I have, you have seen everything he’s ever done in Durham, or you’ve never seen his work, this is a concert you don’t want to miss. Especially since ADF set the ticket price for this anniversary show at the year 2000 level. Untitled No. 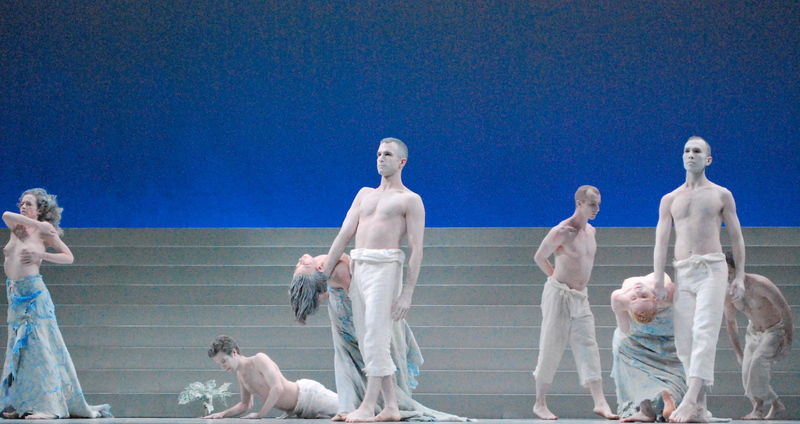 12-2 (co-commissioned by the ADF and Spoleto Festival USA) projects images of 11 of Shen Wei’s recent paintings as prologue and intermittent backdrops to the white-floored stage. The dancers make painting number 12. (The work was first performed in Miami, with the real paintings–thus the 12-2 designation.) Shen Wei tends to work at an operatic scale, thanks at least in part to his early training in Chinese opera: the paintings are very large, and the projections of them fill the back wall. In layered and encrusted acrylic and oils in many shades of blacks, whites and grays, these highly accomplished paintings remind us that Shen Wei was also trained in calligraphy and traditional Chinese painting, and that alongside his dance works, he has steadily made visual art. In these abstract paintings I saw gorges, caves, rivers calm or turbulent, birds, boulders…and the flow of time. The 16 dancers wear costumes in a similar range of shades, asymmetrical, with unexpected open areas, truncated parts, and grouped pleats like folded wings. Each one is different from all the rest. So is each dancer’s movement. At no time during the piece are any two dancers doing the same thing. 16 people move together independently. They enter in a line, stage left, to move soundlessly in silence across it like a river. Maintaining their line, they dip and rise while flowing onward past our view. 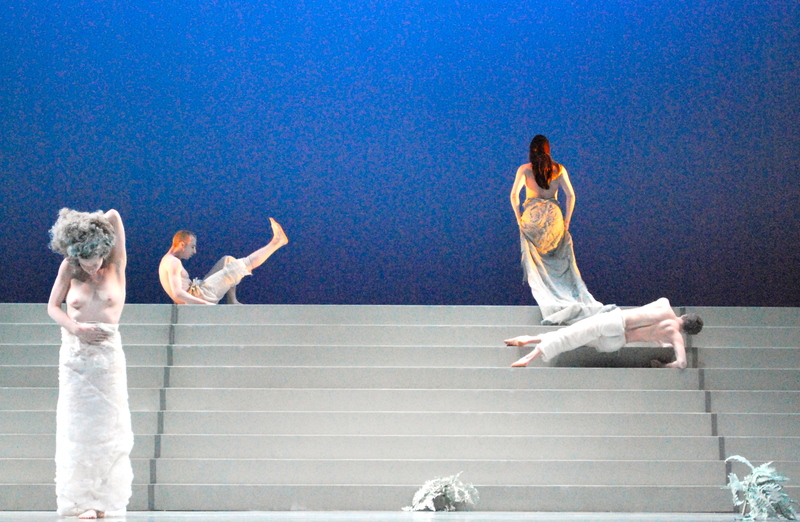 Later, the dancers make the rhythmic clicks of Shen Wei’s “Metronome Collage” sound design, and then comes Chou Wen-Chung’s music, Echoes From the Gorge, spare and haunting. After their introductory crosswise flow of motion (compare in your mind to the upstage-downstage flow in From the Terrace, with its waterfall of bodies coming toward the viewer), the dancers activate the stage space in a different way, like breathing nature embodied. The tempo is the same as steady deep breathing, and even when one or more of the dancers holds a pose (like an egret, or a rock) the vital invisible life force remains uninterrupted, as the other dancers flow on, massing and separating, massing and separating, each behaving differently at every moment, but all using the same vocabulary of liquidity and angularity to tell of the wholeness made from all the parts. For this viewer, Untitled No. 12-2 is the most entrancing of Shen Wei’s works to date, with the most profound emotional impact. Shen Wei’s Untitled No. 12-2, in performance at ADF June 11, 2015. Photo: Grant Halverson. Shen Wei is master of many arts, and one of them is the art of contrast. 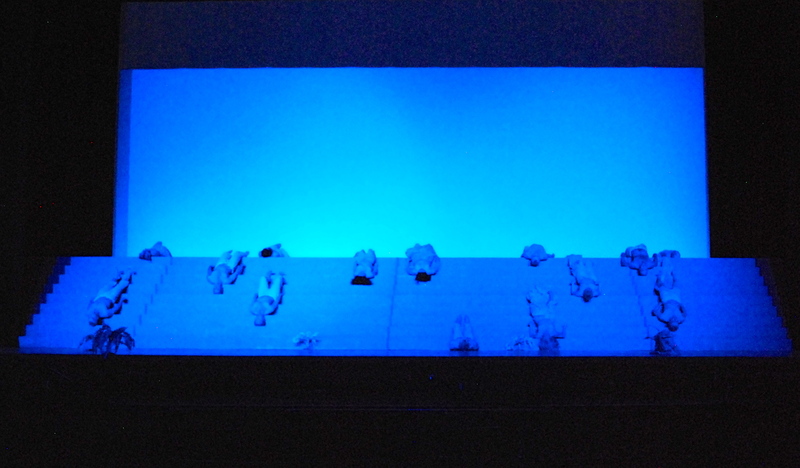 After intermission comes his superb 2005 dance Map, in which the individuals in the 14-member ensemble often do exactly the same things at precisely the same time. 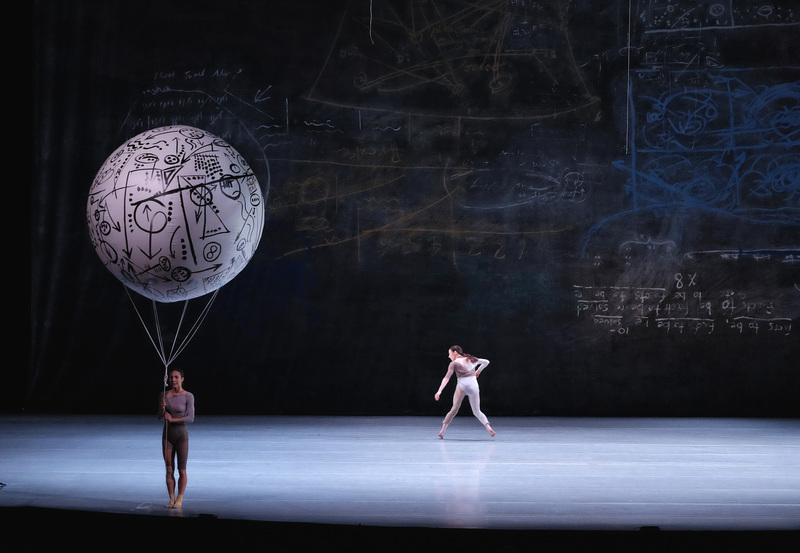 Map is now even better with the addition of huge balloons marked, like the 53′ x 30′ backdrop, with figures and symbolic notations concerning the dance and its dancers (both painted by Shen Wei, with some assistance). I was fascinated by the balloons–they are the opposite of the backdrop: volumetric; on the audience side of dancers and the proscenium, and they rise, rather than drop. 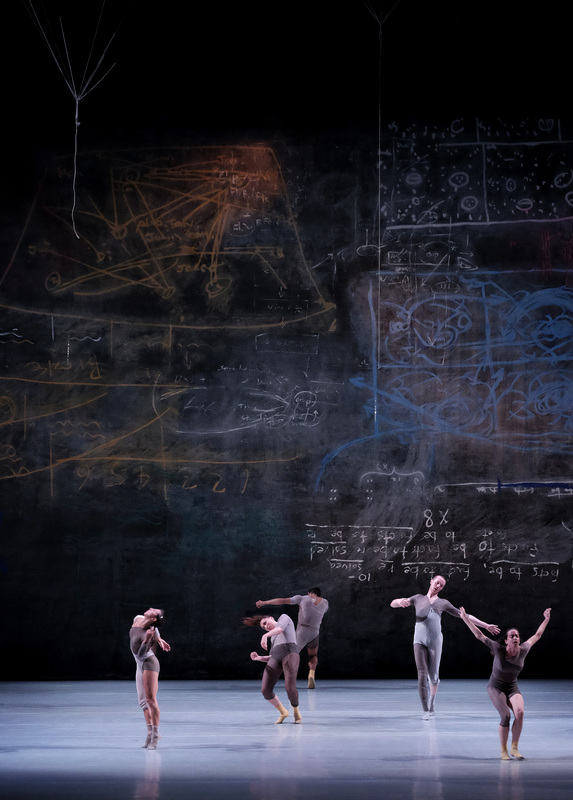 Map is set to selections from The Desert Music, Steve Reich’s gorgeous, propulsive composition with mystical vocal elements, and like the music, has a mathematical aspect, as Shen Wei has the dancers explore a great many of the possible permutations of human movement. This work was thrilling enough in Reynolds Theater in 2006, but the larger stage of the DPAC allows more beautiful spacing and a greater scope for the whirling changes. It also looks more interesting now because SWDA has become a more physically diverse company. Ten years ago, the dancers were much of a size, all slender and fairly small. Often one could not tell if the body in motion was male or female. Now there is a range of heights and body types. Shen Wei’s Map, with balloons, performed at ADF, 6-11-2015. Photo: Grant Halverson. The dancers were on fire in this piece last night, twisting, rolling, writhing, jumping, spinning, swooping with the abandon that comes only with the control developed through repetitive practice under the eye of a perfectionist choreographer. Every night I’m not in the theater during the summer I spend watching the swifts mass, wheel, separate, swoop and return across the wide sky. I can’t give any higher praise than to say this dance and its dancers were as beautiful and heart-expanding as those soaring birds. This program repeats (minus the opening ceremony honoring Baba Chuck Davis) June 12 and 13. See the ADF site for details. All the possibilities of being human. Shen Wei’s Map, ADF, 6-11-2015. Photo: Grant Halverson.